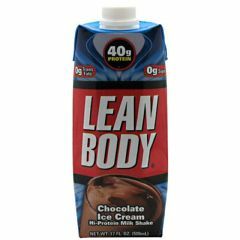 AllegroMedical.com presents The Labrada Nutrition Lean Body RTD - Chocolate Ice Cream Protein Drink. Zero Sugar. Lactose Free. Award-Winning Taste! Lean Body, Hi-Protein Ready-to-Drink Milk Shake. 40g Protein. Lean Body, build Lean muscle and Burn Fat! Lean Body, Ready-to-Drink shakes provide quick, delicious lean muscles nutrition for athletes with little time off preparing meals. Just twist open the re-sealable top and enjoy Lean Body's award-winning taste! Lean body satisfies your appetite, increases your energy levels, and makes you feel great. Use Lean Body in conjuction with your exercise program to help you build lean muscle and burn fat. Award-Winning Taste. Tastes like a delicious, creamy milkshake! 40 grams LeanPro Muscle Building Protein. No Sugar-Zero! Lactose-Free! Patented flash-heat aseptic processing results in less denatured protein than canned protein drinks. 25% more protein than other aseptic RTD's. 50% less fat than other aseptic RTD's. Patented New Container-Resealable top-drink it now and later! No Trans Fat. No hydrogenated oil. Nutritional Powerhouse-Fortified with 22 vitamins and minerals! Filtered Water, Lean Pro (Special Blend of Spray Dried Ultrafiltered Milk Protein Isolate, Yielding Fast Acting Whey Protein Peptides, Branched Chain Amino Acid, L-Glutamine Peptides, and Slow Acting Casein Peptides, Whey Protein Concentrate, Calcium Caseinate), High Oleic Safflower Oil, Cocoa Processed with Alkali, Cocoa, FiberPlex (Fructooligosaccharides, Cellulose Gel, Cellulose Gum, Carageenan, Xanthan Gum), Vitamin and Mineral Blend )Potassium Phosphate, Potassium Citrate, Magnesium Phosphate, Sodium Ascorbate, Zinc Sulfate, Tocopherol Acetate, Biotin, Vatamin A Palmitate, Niacinamide, Phytonadione, Potassium Iodide, D-calcium Pantothenate, Chromium Chloride, Copper Sulfate, Cyanocobalamin, Sodium Molybdate, Sodium Selenite, Folic Acid, Cholecalciferol, Pyridoxine Hydrochloride, Riboflavin, Thiamin Monoitrate, Ferric Orthophosphate, Manganese Sulfate),Nnatural Flavors, Soy Lecithin, Citric Acid, Sucralose, Salt, Acesulfame Potassium.